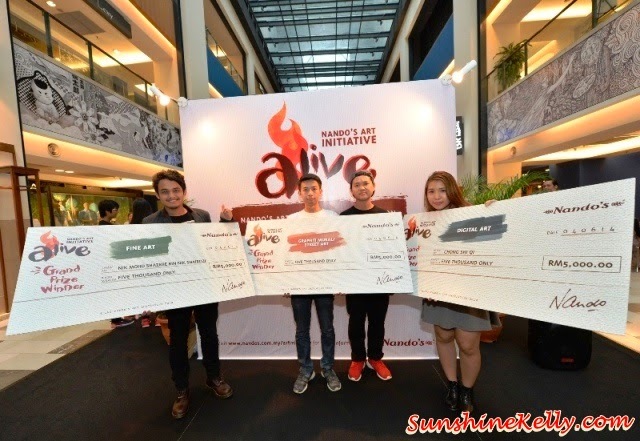 Last week Nando’s announced their 2014 Art Initiative New Champions at the Square, Publika Solaris Dutamas. The 7th installation of its annual art initiative, themed “Alive,” with a staggering 548 submissions, this year’s competition was its biggest yet. Over 40 colleges and universities also contributed to the 362 fine art, 150 digital art and 36 graffiti mural/street art submissions. A display of 54 immersive art pieces will be held in Publika for the public to indulge in from 4 – 15 June 2014. The exhibition is to expose the talents and workings of the best participants and give avid art enthusiasts a chance to own a piece of that ingenuity through an open silent auction. Proceeds from the sale are given to the artists who will receive 50% percent of the sale price while the remaining 50% will go to the winners’ college or university. The panel of judges for Nando’s 2014 Art Initiative - Rachel Jena, Art Editor of TimeOut KL; Ali Bebit, former winner of Nando’s Art Initiative, now acclaimed artist and sculptor; Nini Ramlan, Head of Content Innovation at Primeworks Studios, painter and illustrator; Bee from Phobia, graffiti artist; Kenji, graffiti artist; Ian Cruddas, CEO of Nando’s Chickenland Malaysia Sdn Bhd; and Mac Chung Lynn, Group CEO Nando’s Chickenland (Malaysia and Singapore). The Nandos Art Initiative was introduced in 2008 has served as a platform for creative expression and development. This has brought to the forefront an assemblage of young artistes in Malaysia who now have an exciting avenue to promote their abilities and creative production.